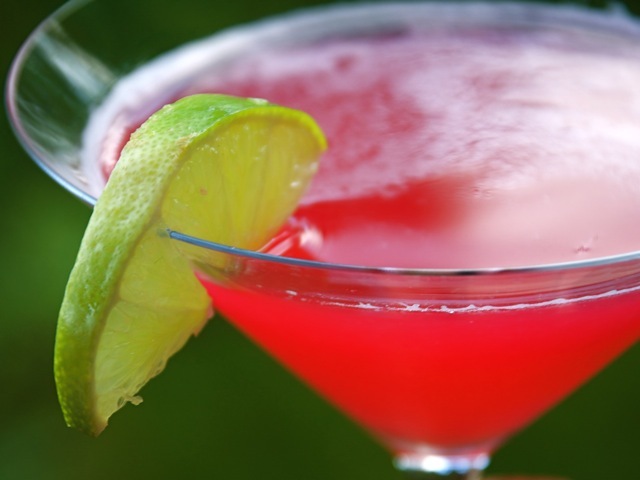 The ever-popular Cosmopolitan is basically a kamikaze tinted pink with cranberry juice. Rhubarb syrup colors and flavors this Cosmo for a delicious seasonal cocktail. For a non-alcoholic drink, pair rhubarb syrup with seltzer water for a refreshing soda. Fill a cocktail shaker with ice, then pour in the vodka, the citrus juice, and the rhubarb syrup. Shake vigorously, then strain into two martini glasses. Garnish with half-moons of lime. Read more about summertime drinks in Carrie Floyd's article "Cool summer cocktails."